Join 826michigan volunteers, students, and families at Stamps Gallery to create small books filled with original stories during this Bibliobandido bookmaking workshop. Stories will be shared aloud in order to satiate the hunger of legendary bandit and story-eater Bibliobandido. Light refreshments will be provided. 826michigan is a non-profit after school tutoring program that inspires school-aged students to write confidently and skillfully with the help of adult volunteers in their communities. 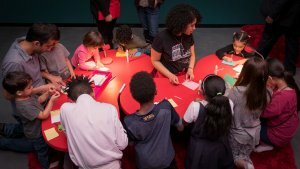 Image: bookmaking workshop at the Sugar Hill Museum, 2017.